Story copyright © 1997, 2002, 2003 Aaron Shepard. Script copyright © 2004 Aaron Shepard. Scripts in this series are free and may be copied, shared, and performed for any noncommercial purpose, except they may not be posted online without permission. 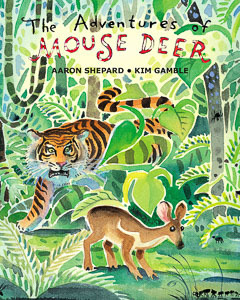 PREVIEW: Mouse Deer is small, and many animals want to eat him—but first they have to catch him! NOTES: For best effect, place NARRATOR 1 at far left (as seen from the audience), and NARRATOR 2 at far right. The conversations between the NARRATORS and between them and MOUSE DEER will be more believable if the readers learn those speeches by heart and don’t look at their scripts. Below is the tune for “Mouse Deer’s Song,” an original composition of the author’s. NARRATOR 1: Today we’re going to tell you three stories about Mouse Deer. NARRATOR 2: (to NARRATOR 1, suspiciously) Wait a minute. Did you say “Mouse Deer”? NARRATOR 2: I never heard of a “Mouse Deer”! What is he? A mouse? NARRATOR 2: (accusingly) Hey, are you trying to trick us? NARRATOR 1: No! He’s a real animal! NARRATOR 2: (skeptically) Yeah? Then how big is he? NARRATOR 1: About as big as a cat. NARRATOR 2: And where does he live? NARRATOR 1: In the jungles of Asia and Africa. NARRATOR 2: And what does he look like? NARRATOR 1: His legs and tail look like a deer’s. NARRATOR 2: (starting to believe) Well, all right. NARRATOR 1: But his face and body look like a mouse’s. NARRATOR 2: (accusingly again) You’re tricking us! NARRATOR 1: It’s true! That’s why he’s called Mouse Deer! NARRATOR 2: (grudgingly) Well, maybe we believe you. Tell us some more. NARRATOR 1: (to both NARRATOR 2 and audience) Mouse Deer eats only plants, but lots of animals eat Mouse Deer. To stay alive, he has to be quick and smart. He also has to be tricky—just like Brer Rabbit and Anansi, the spider man from Africa. Mouse Deer even plays some of the same tricks. NARRATOR 2: (to NARRATOR 1) You know what I think? I think you’re the tricky one! NARRATOR 1: No, I’m not! There are lots of stories about Mouse Deer. NARRATOR 2: (sarcastically) And I bet you want us to believe they’re true! NARRATOR 1: Of course they are! All stories are true—even if they didn’t happen. NARRATOR 2: (confused, to audience) Huh? NARRATOR 1: (to audience) Mouse Deer has his own song too, and you can help sing it. Here’s how it goes. I’m quick and smart as I can be. Try and try, but you can’t catch me! NARRATOR 1: Good! Now we’re ready to go. MOUSE DEER: (brightly, to audience) Mouse Deer . . .
TIGER: (ferociously, to audience, showing claws) . . . Tiger. NARRATOR 1: Mouse Deer sang his song as he walked through the forest. He was looking for tasty fruits and roots and shoots. NARRATOR 2: Though he was small, he was not afraid. He knew that many big animals wanted to eat him. But first they had to catch him! NARRATOR 1: Then he heard something. NARRATOR 2: There was Tiger! TIGER: (sounding sinister) Hello, Mouse Deer. I was just getting hungry. Now you can be my lunch. NARRATOR 1: Mouse Deer didn’t want to be lunch. He looked around and thought fast. NARRATOR 2: He saw . . . a mud puddle. MOUSE DEER: (makes a face like he’s thinking hard, then brightens, turns to TIGER) I’m sorry, Tiger. I can’t be your lunch. The King has ordered me to guard his . . . pudding. MOUSE DEER: (pointing) Yes. There it is. NARRATOR 1: Mouse Deer pointed to the mud puddle. MOUSE DEER: It has the best taste in the world. The King doesn’t want anyone else to eat it. NARRATOR 2: Tiger looked longingly at the puddle. TIGER: (struggling with himself, knowing he shouldn’t ask but wanting it badly) I would like to taste the King’s pudding. MOUSE DEER: Oh, no, Tiger! The King would be very angry. TIGER: (pleading) Just one little taste, Mouse Deer! The King will never know. MOUSE DEER: Well . . . all right, Tiger. But first let me run far away, so no one will blame me. TIGER: All right, Mouse Deer, you can go now. NARRATOR 1: Mouse Deer ran quickly out of sight. TIGER: (delightedly, to audience) Imagine! The King’s pudding! NARRATOR 2: He took a big mouthful. TIGER: (puts a handful in his mouth, freezes in surprise, then makes a horrible face and spits the mud out toward audience) Phooey! NARRATOR 2: He spit it out. TIGER: Yuck! Ugh! Bleck! That’s no pudding. That’s mud! NARRATOR 1: Tiger ran through the forest. NARRATOR 2: He caught up with Mouse Deer. TIGER: (fuming) Mouse Deer, you tricked me once. But now you will be my lunch! NARRATOR 1: Mouse Deer looked around and thought fast. NARRATOR 2: He saw . . . a wasp nest in a tree. MOUSE DEER: (thinks hard, then brightens) I’m sorry, Tiger. I can’t be your lunch. The King has ordered me to guard his . . . drum. NARRATOR 1: Mouse Deer pointed to the wasp nest. MOUSE DEER: It has the best sound in the world. The King doesn’t want anyone else to hit it. TIGER: (struggling with himself) I would like to hit the King’s drum. TIGER: Just one little hit, Mouse Deer! The King will never know. NARRATOR 2: Mouse Deer ran quickly out of sight. TIGER: (to audience) Imagine! The King’s drum! NARRATOR 1: He reached up and hit it. Pow. NARRATOR 1: The wasps all flew out. They started to sting Tiger. TIGER: Ouch! Ooch! Eech! That’s no drum. That’s a wasp nest! NARRATOR 1: Tiger ran away. But the wasps only followed him! NARRATOR 1: Tiger came to a stream. He jumped in—splash!—and stayed underwater as long as he could. At last the wasps went away. NARRATOR 1: Then Tiger jumped out. NARRATOR 2: He ran through the forest till he found Mouse Deer. TIGER: (enraged) Mouse Deer, you tricked me once. You tricked me twice. But now you will be my lunch! NARRATOR 2: He saw . . . a cobra! The giant snake was coiled asleep on the ground. MOUSE DEER: (thinks hard, then brightens) I’m sorry, Tiger. I can’t be your lunch. The King has ordered me to guard his . . . belt. NARRATOR 1: Mouse Deer pointed to the cobra. MOUSE DEER: It’s the best belt in the world. The King doesn’t want anyone else to wear it. TIGER: (struggling with himself) I would like to wear the King’s belt. MOUSE DEER: Oh, no Tiger! The King would be very angry. TIGER: Just for one moment, Mouse Deer! The King will never know. TIGER: (to audience) Imagine! The King’s belt! NARRATOR 1: He started to wrap it around himself. The cobra woke up. NARRATOR 1: It didn’t wait for Tiger to finish wrapping. It wrapped itself around Tiger. Then it squeezed him and bit him. TIGER: Ooh! Ow! Yow! That’s no belt. That’s a cobra! (into the distance) Help! Mouse Deer! Help! NARRATOR 1: But Mouse Deer was far away. NARRATOR 2: And as he went, he sang his song. CROCODILE: (menacingly, to audience, in low, growly voice) . . . Crocodile. NARRATOR 1: One day, Mouse Deer went down to the river. He wanted to take a drink. NARRATOR 2: But he knew Crocodile might be waiting underwater to eat him. NARRATOR 2: (to NARRATOR 1) Wait a minute! Stop the story! Mouse Deer said he’d put in his leg? What a dumb idea! I thought Mouse Deer was supposed to be smart! NARRATOR 1: (to both NARRATOR 2 and audience) But Mouse Deer didn’t put in his leg. Instead, he picked up a stick with his mouth and put in one end. NARRATOR 2: Crocodile grabbed the stick and pulled it underwater. NARRATOR 1: Mouse Deer laughed. MOUSE DEER: (laughs) Silly Crocodile! Don’t you know a stick from a leg? NARRATOR 2: And he ran off to drink somewhere else! NARRATOR 1: Another day, Mouse Deer went back to the river. All he saw there was a floating log. NARRATOR 2: But he knew Crocodile looked like a log when he floated. NARRATOR 2: (to NARRATOR 1) Hold everything! Mouse Deer said Crocodile would be quiet but a log would say something? Now, that’s really dumb! NARRATOR 1: (to both NARRATOR 2 and audience) But then Mouse Deer listened. CROCODILE: (low and growly) I’m really just a log. MOUSE DEER: (laughs) Silly Crocodile! Do you think a log can talk? NARRATOR 2: And off he ran again! NARRATOR 1: Another day, Mouse Deer wanted to cross the river. He wanted to eat tasty fruits and roots and shoots on the other side. NARRATOR 2: But he didn’t want Crocodile to eat him first! NARRATOR 2: (to NARRATOR 1) I don’t believe this! Mouse Deer called for Crocodile? How dumb can he get! NARRATOR 1: (to both NARRATOR 2 and audience) But then Crocodile rose from the water. CROCODILE: (low and growly) Hello, Mouse Deer. Have you come to be my breakfast? MOUSE DEER: Not today, Crocodile. I have orders from the King. He wants me to count all the crocodiles. CROCODILE: (very impressed) The King! Tell us what to do. MOUSE DEER: You must line up from this side of the river to the other side. NARRATOR 2: Crocodile got all his friends and family. They lined up across the river. NARRATOR 1: Mouse Deer jumped onto Crocodile’s back. NARRATOR 2: He jumped onto the next crocodile. NARRATOR 1: And the next. NARRATOR 2: Mouse Deer kept jumping till he jumped off . . . on the other side of the river. CROCODILE: (calling across the river) How many are there? MOUSE DEER: (calling back) Just enough! And all silly! NARRATOR 1: Then he went off singing his song. NARRATOR 1: In our last story, Mouse Deer meets his most dangerous enemy of all. (to NARRATOR 2) Can you guess who it is? NARRATOR 2: Uh . . . Cobra! NARRATOR 2: Uh . . . Lion! NARRATOR 2: Uh . . . Tyrannosaur! FARMER: (pleasantly, to audience) . . . Farmer. NARRATOR 1: Mouse Deer loved to eat the fruits and roots and shoots of the forest. But he loved something else even more. NARRATOR 2: He loved the vegetables in Farmer’s garden. NARRATOR 1: One day, Mouse Deer went to the edge of the forest. NARRATOR 2: He looked out at row after row of vegetables. MOUSE DEER: (to himself) Mmmm. Juicy cucumbers! Yummy yams! NARRATOR 1: He started into the garden. MOUSE DEER: (in pain and shock, looking at his leg) Oh! NARRATOR 2: His leg was caught in a snare! NARRATOR 1: Mouse Deer pulled and pulled. NARRATOR 2: But he could not get away. MOUSE DEER: Oh, no! Farmer will have me for dinner! NARRATOR 1: Then he saw Farmer coming. Mouse Deer thought fast. NARRATOR 2: He lay on the ground and made his body stiff. FARMER: (pleasantly, to himself) Well, well. Look what I caught. A mouse deer! (looks closer) But he looks dead. NARRATOR 1: Farmer pushed him with his foot. NARRATOR 2: Mouse Deer didn’t move. FARMER: Maybe he’s been dead a long time. Too bad! I guess we can’t eat him. NARRATOR 1: He pulled Mouse Deer’s leg out of the snare. Then he tossed Mouse Deer back into the forest. NARRATOR 2: Mouse Deer landed with a soft plop. Then he jumped up and ran. FARMER: (calling after him angrily) Hey! You tricked me! MOUSE DEER: (laughs, then to audience) Farmer is smart. But Mouse Deer is smarter! NARRATOR 1: A few days passed. Mouse Deer kept thinking about all those vegetables. NARRATOR 2: One day, he went back to the edge of the forest. MOUSE DEER: (to himself) Mmmm. Tasty gourds! Scrumptious sweet potatoes! NARRATOR 1: Then he saw something new. NARRATOR 2: It looked like a man. But its head was a coconut, and its body was rubber. MOUSE DEER: A scarecrow! That silly Farmer. Does he think he can scare me with that? I’ll show him how scared I am! NARRATOR 1: Mouse Deer marched up to the scarecrow. He gave it a big kick. NARRATOR 2: But his leg stuck to the scarecrow. The scarecrow was covered with sticky sap from a rubber tree! NARRATOR 1: He pulled and he pulled. Then he pushed with his other front leg. NARRATOR 2: That leg stuck too. NARRATOR 1: He pulled and he pulled. Then he pushed with his two back legs. NARRATOR 2: They stuck too. NARRATOR 1: He pulled and he pushed and he pulled and he pushed. NARRATOR 2: But Mouse Deer was trapped. NARRATOR 1: Then he saw Farmer. NARRATOR 1: Mouse Deer thought fast. NARRATOR 2: But he didn’t have any ideas! FARMER: (pleasantly) Well, well. How nice of you to come back. NARRATOR 1: He pulled Mouse Deer off the scarecrow and carried him to the house. NARRATOR 2: He put him outside in an empty chicken coop. NARRATOR 1: All that night, Mouse Deer couldn’t sleep. He didn’t want to be dinner! NARRATOR 2: When the sun rose, Mouse Deer just lay there sadly. Then he heard something. DOG: (in a barking voice) Why, it’s Mouse Deer! DOG: So Farmer caught you at last. It serves you right! NARRATOR 1: It was Farmer’s dog. NARRATOR 2: Mouse Deer thought fast. MOUSE DEER: (thinks hard, then brightens) What do you mean, Dog? Farmer didn’t catch me. DOG: (suspiciously) Then why are you in the coop? MOUSE DEER: Because there aren’t enough beds in the house. You see, Farmer is holding a feast tomorrow. And I’m the guest of honor. DOG: Guest of honor? That’s not fair! I’ve been his loyal friend for years, and you’re just a thief. The guest of honor should be me! MOUSE DEER: (thoughtfully) You know, Dog, you’re right. Why don’t you take my place? When Farmer sees you in here, he’ll make you the guest of honor instead. DOG: (surprised) Really? You don’t mind? MOUSE DEER: Not at all. You deserve it. DOG: Mouse Deer, you’re not so bad after all. Thank you! NARRATOR 1: Dog lifted the latch and opened the door. MOUSE DEER: You’re welcome, Dog. Enjoy the feast. NARRATOR 2: Mouse Deer ran for the forest. Then he watched from the forest edge. NARRATOR 1: He saw Farmer come out and stare at Dog. NARRATOR 2: Then he heard Farmer yell. FARMER: You stupid dog! You let the mouse deer get away! MOUSE DEER: (laughs, then to audience) Farmer will have to find a different dinner now! NARRATOR 2: Then he went off singing his song. NARRATOR 1: And there they are—three stories about Mouse Deer. (to NARRATOR 2) Now do you believe in him? NARRATOR 2: Well, I guess so, but . . . MOUSE DEER: (to NARRATORS) Hey! Who are you? NARRATOR 1: Hi, Mouse Deer. We’re the narrators. We help tell the stories. MOUSE DEER: Help tell . . . ?! Hey, are you trying to trick me? (waves to audience) Bye, now! NARRATORS 1 & 2: (confused, to audience) Huh?